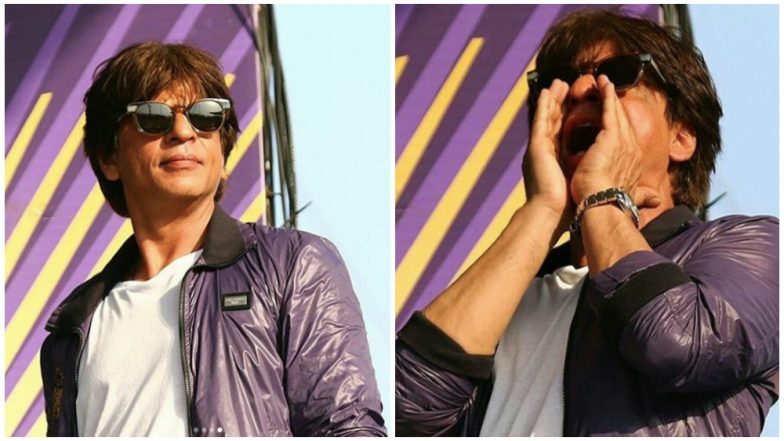 IPL 2019: KKR May Have Lost to CSK Today, But We Were Cheering for Shah Rukh Khan's Eden Gardens Look - View Pics! Shah Rukh Khan makes it a point to attend all KKR- Kolkata Knight Riders matches and we totally love how he supports his team all through the big wins as well as the losses. The Bollywood superstar flew to Kolkata today to attend the crucial game of KKR Vs CSK which was held at Eden Gardens. The actor was greeted with a huge crowd at Dum Dum airport on his arrival and the Zero star made sure to give his fans a moment and even blew flying kisses for them. We loved Shah Rukh's dapper appearance at today's match as he sported the white t-shirt with the KKR logo along with a lovely purple jacket of the team. Shah Rukh Khan Watching an IPL 2019 Match with Director Atlee Makes us Wonder if He's Planning a Remake of Vijay's Mersal. On the work front, Shah Rukh Khan was last seen in Zero which hit the screens, December last year. Fans have been eagerly waiting to hear about his next project, which could be Madhur Bhandarkar's upcoming film, Inspector Ghalib. In the meantime, we are just happy to see the Shah Rukh look his absolute best at these IPL matches.